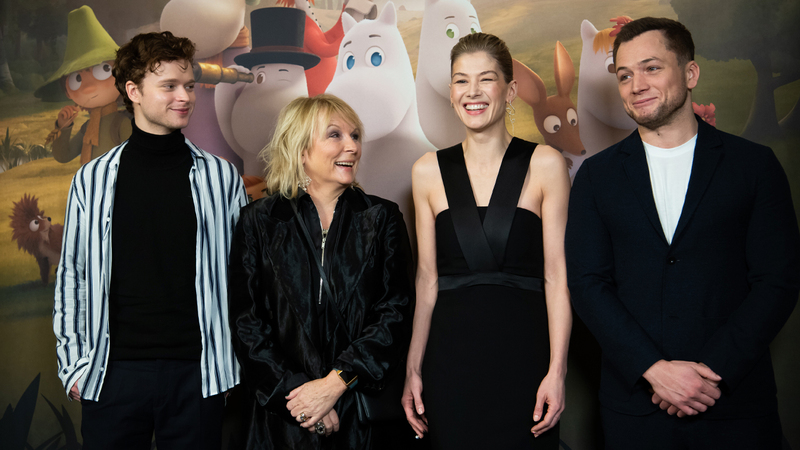 There is Moomintroll, Moominmamma and Moominpappa – little white trolls who live in Moominvalley, with other fantastical creatures such as the Hattifatteners, Mymbles and Whompers. Tove Jansson’s Moomin books have sold in their millions, and been translated into forty four languages. Philip Pullman, author of His Dark Materials, has described her as a genius. Other devotees include Michael Morpurgo and Frank Cottrell Boyce, who scripted the 2012 Olympic opening ceremony. Tove Jansson grew up in an artistic household in Helsinki. Her father, a Swedish-speaking Finn, was a sculptor, her Swedish mother an illustrator. While her mother worked, Jansson would sit by her side drawing her own pictures. She soon added words to the images. Her first book – Sara and Pelle and the Octopuses of the Water Sprite – was published when she was just thirteen. Jansson later said that she had drawn the first Moomin after arguing with one of her brothers about the philosopher Immanuel Kant. She sketched “the ugliest creature imaginable” on the wall and wrote under it ‘Kant’. It was this ugly animal, or a plumper and friendlier version of it, that later brought her worldwide fame. Jansson studied art in Stockholm and Helsinki, then in Paris and Rome, returning to Helsinki just before the start of World War Two. “The war had a great effect on Jansson and her family. One of her brothers, Per Olov, was in the war. They didn’t know where he was, if he was safe, and if he was coming back,” says Boel Westin, a friend of Jansson’s for twenty years and a Professor of Literature at Stockholm University. Jansson’s first Moomin book – The Moomins and the Great Flood – was published in 1945, at the end of this difficult and nerve-wracking period, with Comet in Moominland following soon after. Jansson’s first books went largely unnoticed and her breakthrough came in 1951, when Finn Family Moomintroll was translated into English. Two new characters – Thingumy and Bob – appear in the book. The pair represent Tove Jansson and a married woman, Vivicka Bandler, with whom she had a brief and passionate affair. Homosexuality was illegal in Finland at the time, so their relationship was a secret. “Thingumy and Bob are always together, walking hand in hand, but they won’t tell anyone what is in it. It is just referred to as ‘the content’,” says Westin. “You could read this as being the lesbian love between Tove and Vivicka. They have their secret love in this suitcase, and when they open the suitcase and show it to the whole of Moominvalley it is also a picture of how they show their love to the world. It’s a really beautiful story,” says Westin. Finn Family Moomintroll‘s success caught the attention of Charles Sutton, a London agent who offered Jansson a lucrative deal to produce a Moomin comic strip for London’s Evening News. Jansson agreed to produce six strips a week for seven years, starting in 1954. It was an instant hit and within two years 120 newspapers around the world were running it, reaching twelve million readers. 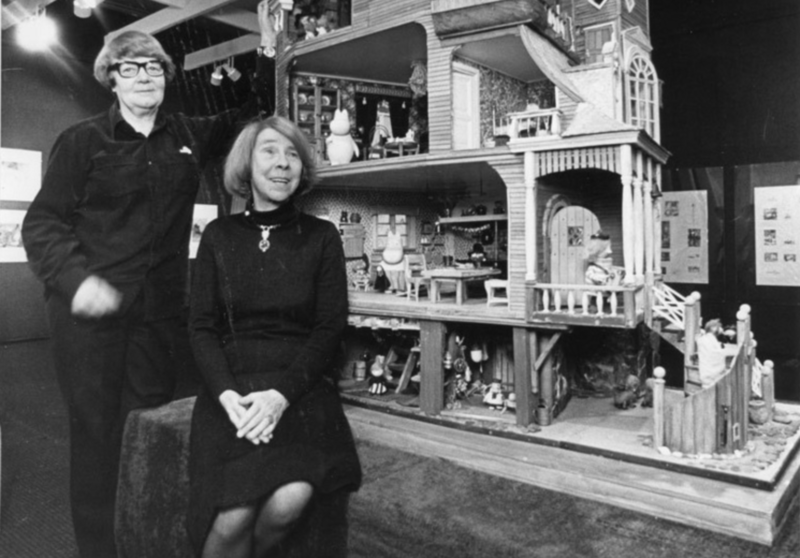 Tove Jansson’s creation was taking over her world and, she felt, obscuring her true talents as an artist. To reflect her frustration, she began to draw the Moomintroll bigger and bigger until it dwarfed everything else around it. In 1956, by the record player at a party, Jansson met a fellow artist, Tuulikki Pietila, or ‘Tooti’, as she was known. Jansson asked her to dance. Pietila refused, unwilling to break with social convention. But not long afterwards, Jansson went to Tuulikki’s apartment on a winter’s evening and the pair drank wine and listened to music, becoming lifelong partners. Pietila’s influence on Jansson’s next book, Moominland Midwinter, is not hard to detect. The Moomins spend a lot of their time close to water, on boats, or on islands. This was true of the Jansson family too, who used to spend summers on Klovharu, a tiny uninhabited island in the Gulf of Finland. It was there in 1970 that Jansson began writing her final Moomin book, Moominvalley in November, a melancholy story reflecting the author’s grief after the death of her mother. It features a new character, Toft, which Jansson based on herself. When Toft arrives at the usually busy Moominhouse, there’s no-one there. The loss of her mother deeply affected Jansson, and the following year she and Pietila embarked on a round-the-world trip. It was at this time that Tove Jansson began writing The Summer Book, her first move into adult fiction. The book, which centres on the relationship between a six-year-old girl and her elderly grandmother, is a barely disguised recreation of the real-world relationship between Jansson’s mother and her grand-daughter, Sophia – also the name of the girl in the book. Eventually, after spending twenty eight summers on Klovharu, Jansson and Pietila, both in their seventies, were no longer fit enough to continue. Tove Jansson died in the summer of 2001, aged eighty seven and Tuulikki Pietila died eight years later. Since The Moomins and the Great Flood in 1945, more than fifteen million Moomin books have been sold around the world. Moomin Characters, the company set up by Jansson and her younger brother to deal with image rights, is today one of the most profitable companies in Finland; its Helsinki office populated by cuddly Moomintrolls from the fifties to the present day. Indeed, most Finnish homes contain some sort of Moomin memorabilia. MARK BOSWORTH is a Helsinki-based journalist. The first series of Moominvalley begins this Friday on Sky One, Sky Kids and Now TV.